Chris Moore is a Technical Support Advisor with ERDE, a camping trailer specialist. 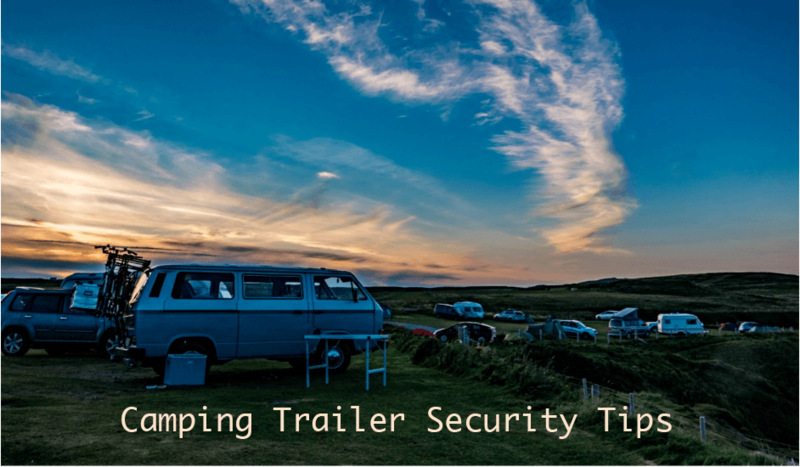 Here, he shares his top tips for keeping your trailer secure during a camping holiday. Headed out into the wild for a camping holiday soon? A box trailer is an ideal way to increase the amount of camping equipment you can bring with you, but there are a number of things you should keep in mind. I’ve shared four of my top tips to help you stay safe and secure, both on the road and while you camp. Read on to learn more. For a camping trip, you’re likely to have a mix of items of varying size and weight, so make sure that these are evenly distributed across the trailer. Stacking too much in certain areas of the trailer will cause an imbalance in the way the trailer is weighted, which could cause it to sway dangerously while you drive. Don’t overestimate your trailer’s weight capacity: check the manufacturer’s maximum weight limit, and stick to it. The trailer becoming unsecured from the car whilst on the road is every driver’s nightmare, so make sure yours is hitched to the tow bar properly. You can read more about how to hitch up your trailer securely in this simple trailer towing and reversing guide. It’s your responsibility to ensure that your trailer is safe when out on the road, and that includes making sure there’s no danger of anything in it falling out. Double check that your cargo is securely tethered to the trailer, and that the tie downs for any canvas covers are tightly fastened to prevent them from flapping around or dragging on the ground as you drive. Ensure that all electrical cables are working, and test the brake lights and indicators to be sure that they are in full working order. You should also check your tyre pressure before you set off. The car and trailer will handle much better, and you’ll even use less petrol. Don’t forget to inspect the condition of your trailer’s spare tyre: there’s nothing worse than getting a puncture only to discover that your back-up is flat, too. Driving with a trailer in tow isn’t too different from ordinary driving, but there are a few things you should keep in mind while you travel. No matter how securely you fasten the tie downs, they will always loosen a little due to the movement of the trailer while on the road. The cargo might also shift and settle into a different position, so stop every hour or so during your journey and check that everything is still secure. You don’t want to arrive at your destination only to find that you unwittingly jettisoned half of your camping gear several miles ago! When driving, you’ll need to allow extra time for braking and acceleration due to the added weight of the trailer. The larger the trailer and the heavier your cargo, the slower you’ll have to go, so give yourself plenty of extra time for your journey. No-one wants to wake up on the first morning of their camping trip to find that their trailer has disappeared in the night. Whether you’re out in the wild or on a campsite, you’ll want to make sure your trailer is fully secured to deter potential thieves. If your trailer has a lockable hard cover, be sure to lock it overnight, preferably with a heavy-duty combination padlock. Don’t assume that your trailer is secure overnight just because it’s still hitched to your car — keep it safe by fitting a hitch lock, which will lock your trailer to your tow bar. For additional security, you could use the hitch lock in conjunction with a wheel clamp. Universal and adjustable wheel clamps are a great investment and will fit most trailers and cover the wheel nuts, meaning potential thieves can’t simply detach the wheel and make a break for it. Just remember to take it off again before you leave! With just a few simple safety checks and security precautions, you can be well on your way to a stress-free trip. Just follow these tips, and you can look forward to a smooth, secure and relaxing camping holiday.